Boosting production by 25 percent while enhancing worker comfort and plant flexibility represented a formidable challenge for the nation’s largest faucet manufacturer. At the Specialty Division of Moen Inc.’s 250,000 sq. ft. plant in Wheeling, IL. Productivity, flexibility, and ergonomics have been effectively addressed with a simple conveyor innovation. Seventeen Adjustable Angle Extruded Alloy LPZ Conveyors from Dorner Manufacturing Corporation has been strategically installed at work cells with high volume, heavy change over rates. Added incrementally during a three-year re-engineering project, the facility recently received Moen’s President’s Award for Improvements in Ergonomics, Cost Control and Productivity. Productivity: The Wheeling facility has automated the segments of its operation with the greatest impact on productivity. 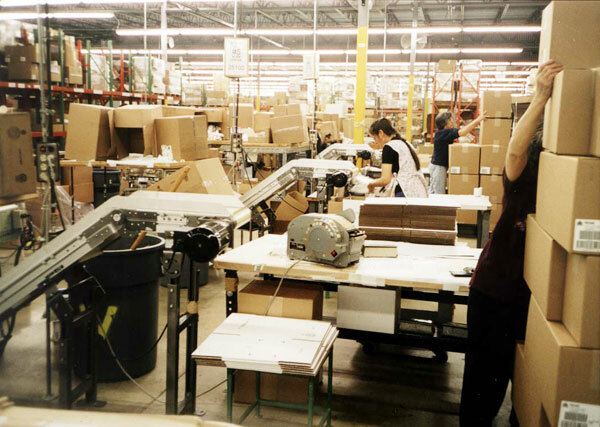 This selective automation has enabled Moen to decrease 1/2 hour from the average production time and increase production by 25%. Flexibility: With more than 9,000 different parts, Moen keeps its production runs short. Changeovers need to be accomplished in two minutes, investing the time savings in increased output. Ergonomics: The LPZ is ergonomically sound and sensible because it reduces the amount of bending and stretching required by an operator. Workers now stand to fill plastic bags and to lower plumbing repair kits onto the conveyor. The conveyor moves the bags from floor level to an ergonomically ideal height and drops the bags into a carton for shipping, making it easier for the operator to offload the carton onto a pallet.